Have you or your partner changed your diet since you started dating? I mean changes like, eating healthier (or vice versa), eating out more/less, and so on. I would think that most of us have one way or another adapted our eating habits since our single days - how much, depends on how different your partner's diet was to start off with. I was quite fortunate as my fiancé was brought up in a very similar way to me: we both ate healthy home-made meals and eating out was saved for special occasions. Nevertheless, I think I have still had an impact on how we are eating now, and the meals I cook are quite different to what our mums would cook for us. The reason I am thinking about this now is that last night I spoiled my fiancé with home-made chicken schnitzels and mashed potato. This is a dish his mum used to make, and made with good quality ingredients, it isn't that unhealthy, but I still wouldn't cook very often. Whenever I cook meat for my fiancé, I make a vegetarian meal for myself. Often it's a salad, as I don't like a heavy meal in the evening anyway. 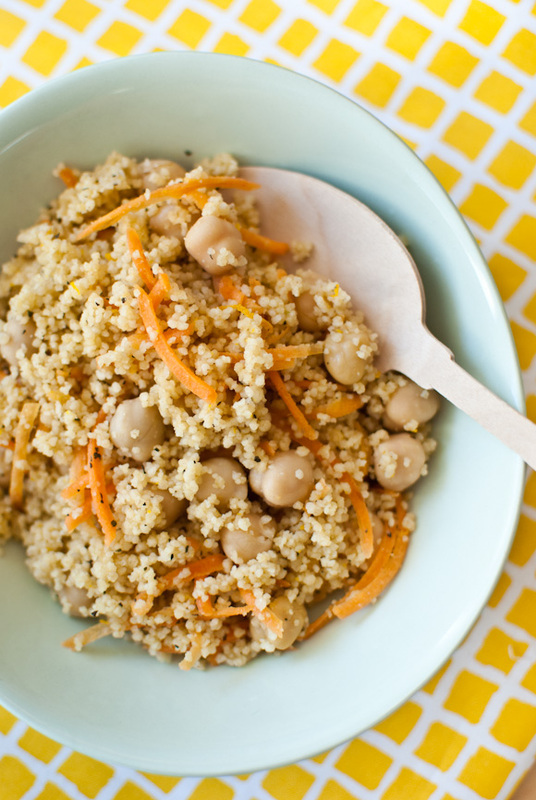 When I do want something heartier, grains like couscous are so easy to prepare and I love the nutty flavour of wholewheat couscous pared with spices, nuts and veggies. 1. Place the couscous, salt, cummin, mint, zest of an orange, and olive oil in a bowl. Pour half of the orange juice and all the boiling water on top and cover the bowl. Leave for a few minutes, then fluff with a fork. 2. Add rest of the orange juice, lemon juice, chickpeas and carrots. Add any optional extras, like sultanas or nuts. Toss and serve immediately. My hubby and I definitely eat differently now. He still eats meat but I do the same and make vegetarian for dinner. This reminds me of how much I love couscous. I can't wait to try this! Maria, this salad looks refreshing, delicioius and healthy. I need more salads like this in my life. As for our partners, my wife and I ate similiar foods when we met so we didn't have to make a lot of changes. The ones we make now are done so together. Beautiful salad! And pictures. me and my boyfriend eating habits are the same as yours. Our mums cooked healthy meals and we didn't go out very often to have a meal in a restaurant (only special occasions). The meals I cook are quite different to what our mums would cook for us because we are vegetarians now. I'm really lucky with my boyfriend. I didn't push anything for him he wanted to change also. looks delicious, AND healthy! can't wait to try this. 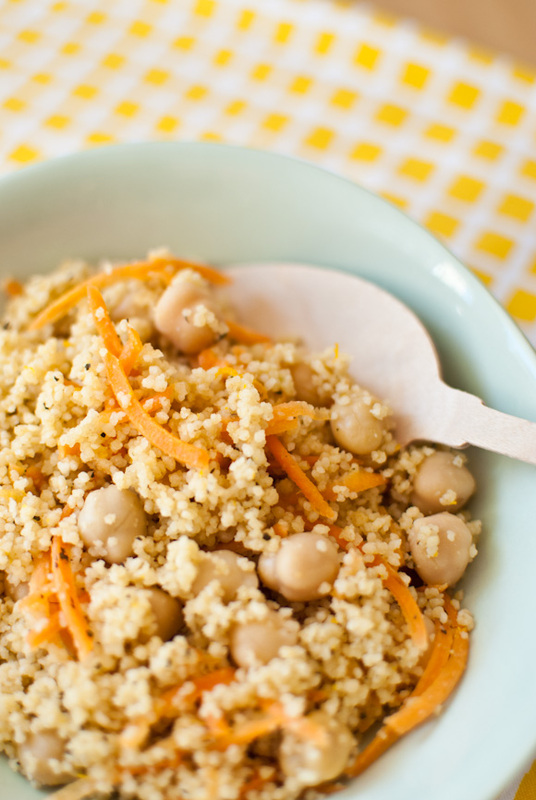 I love couscous, and your salad seems so fresh and easy. I am single now, but one good thing I can say about my exboyfriend is that he liked everything and didn't mind eating vegetarian food all the tie! I think my fiance's diet has changed more than mine since we've been together. He used to be a meat and 3 veg person (I'm vegetarian) but now doesn't eat meat all that often. He still has meat occasionally, and I cook meat for him when he wants it, but it's more of a treat than an everyday thing now. Oh yeah , i had to change little bit here and there. I love fish with skin on and even head of some fishes .. but the husband would eat only and only fillet with no skin. :) Thankfully there is not too much variance in our food choice and we love to try out new stuff! This is a lovely meal .. simple and easy to make. This looks like a great salad! 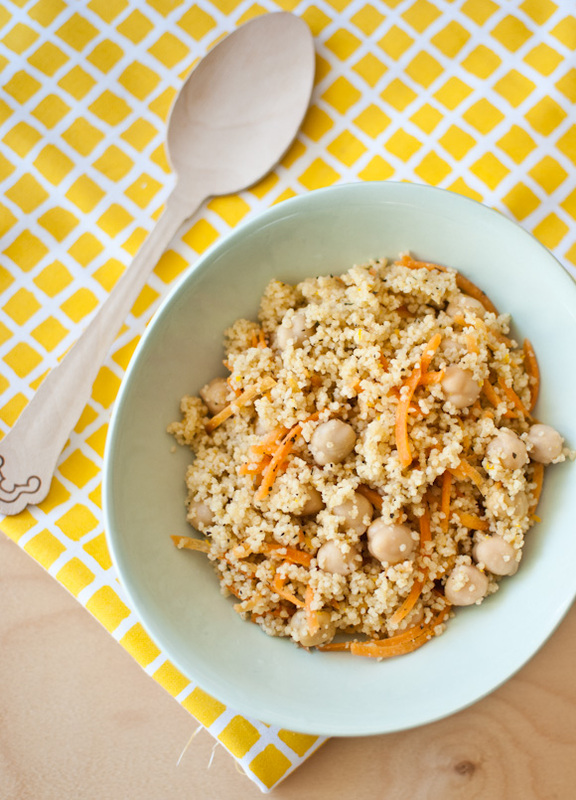 Couscous and orange are a match made in heaven! Love this salad! What a great dish! I'd love this for lunch today :) perfect for non-veggies too just add some grilled chicken or fish on top. YUM! I actually became a vegetarian after my husband and I began dating. It made things a bit tricky-and I think he still wishes I cooked more meat, but he is free to cook his own dinner if he doesn't like what I make- haha! We make it work though! I, too, eat vegetarian (and fish) and live in a house of meat eaters! My husband and sons enjoy vegetarian food, so dinner is easy most evenings. But I do like to make meat meals for them and when I do I, too, make a salad for myself. This is a lovely one you shared!